Police raids and street protests in Baja California have led to scores of injuries in the latest round of labor strife over pay and working conditions in San Quintin, an agricultural region producing produce sold in the United States. This weekend’s violence followed the failure of Interior Minister Luis Miranda Nava to show up for a meeting with leaders of farm worker organizations in the area. Max Correa Hernandez of the Central Campesina Cardenista (CCC), and Fidel Sanchez Gabriel, spokesman for the Movement of Agricultural Workers of San Quentin have called upon the state and federal government to intervene, saying more than 80 people have been injured by police in recent days. La Jornada Baja California says union leaders will be issuing an international call on Wednesday for a boycott of fruits and vegetables exported from this region, in protest of violations of human and labor rights suffered by workers. No details are available as yet about what products or companies will be targeted by the boycotts. The Driscoll company, which imports large quantities of berries, has been mentioned in numerous news accounts. The company claims its workers are treated better than others, although it has been pointed out that much of their product comes via sub-contracted farms in the region. Attempts to negotiate better working conditions and higher wages following walkouts and highway blockades during March collapsed not long after the news media withdrew from the area. 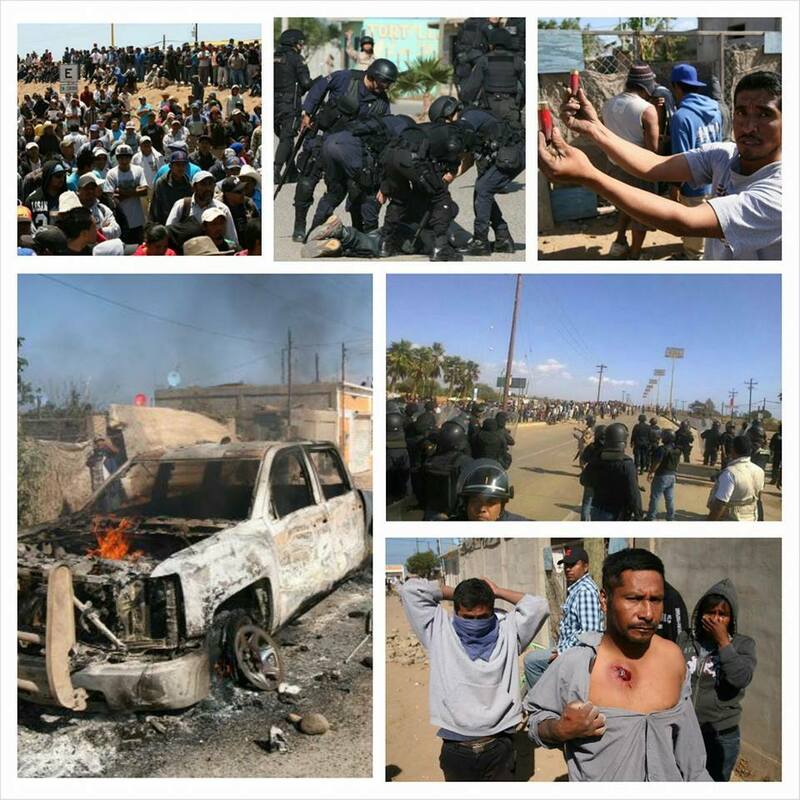 Thousands of Mexican farm workers from ?#?SanQuintin? Baja California, just a few miles from our Southern California border are regrouping right now after a harrowing day of protests and political rallies. Late this afternoon, organizers say hundreds of Mexican federal police attacked a mostly peaceful worker rally and civil disobedience. About 30,000 workers from the San Quintin region (about an hour and a half drive from San Diego) earn less than $10 a day and aren’t given any benefits. The workers have been fighting for a contract that includes at least $14 a day and federal health benefits. Mexican authorities say protesters pelted police with rocks and bottles. Officers responded with tear gas and fired numerous rounds of rubber bullets. Reports estimate dozens were injured. Organizers told La Jornada, a Mexican daily, that police infiltrators began instigating the crowd and are mostly to blame for the unrest. Reports say two cars and a police station were torched. The Mexican army was also patrolling the massive rally but sources say they did not appear to get involved. The country’s military has been dispatched to numerous parts of the country especially in drug routes used by organized crime syndicates. Protesters in the Baja California’s San Quintin region intermittently blocked the Transpeninsular Highway on Saturday and clashed with police outside a tomato ranch. The flare-ups have come several weeks after a farmworkers strike shattered the tranquillity of this major export-oriented agricultural region that grows strawberries, tomatoes and other produce, mainly for the U.S. market. The strikers have been demanding higher pay and improved working conditions. Saturday’s incidents came after a top federal government official, Luis Miranda Nava of the Interior Ministry, failed to show up for a meeting with leaders of the striking farmworkers, according to news reports. Jose Luis Fraga, an official with Mexico’s Federal Highway Police, said in a telephone interview on Saturday afternoon that there had been intermittent closures of the Transpeninsular Highway near the communities of Colonet and Vicente Guerrero, and recommended that travelers avoid the area. Most of the producd grown in San Qintin are certified organic.